Established in 1946, Casio's first technological product was an electro-mechanical calculator, released in 1957. This and subsequent improvements in Japan were about to destroy the adding-machine market. When Commodore's Jack Tramiel saw the future during a visit to Japan, he returned to the US and switched the company - at the time an adding-machine manufacturer - over to the development of proper desktop and pocket calculators. 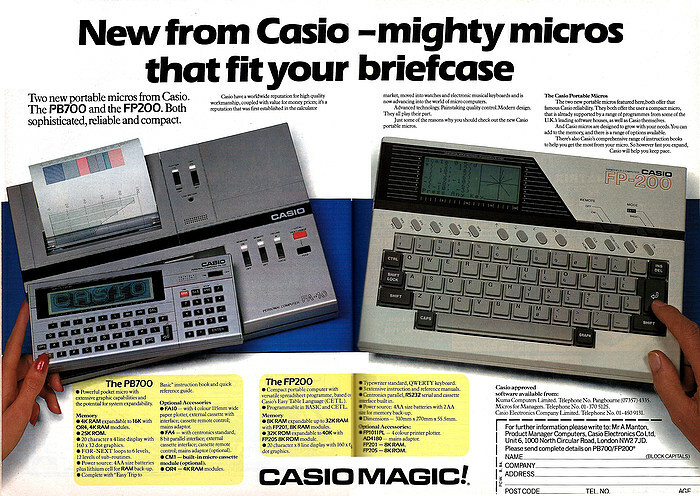 Casio was also part of the early "wrist terminal" revolution, as it started shipping its "Casio data bank read sensor" watch at the end of 1984. The watch could recognise hand-written alpha and numeric characters which, according to Personal Computer World's Japanese correspondent Shinichiro Kakizawa "you write on the glass surface of the watch with your finger [to] become the input data to the watch and are consequently stored in its memory". Although it could only store 1K of data, that was enough for 50 names and telephone numbers, whilst the watch could also double as an eight-digit calculator using the same handwritten inputs. Retailing for only $70, Casio's watch clearly presents an interesting fore-runner to the "smart watches" of 2015, some 30 years later.